There are a lot of candidates that really should just save themselves the embarrassment and just end their campaigns now. 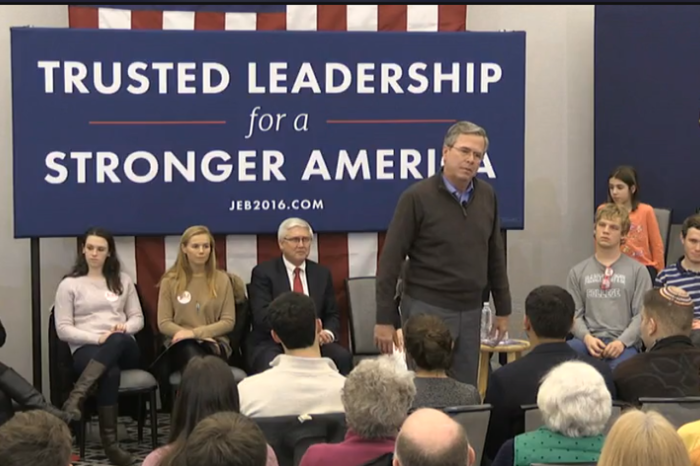 One of those candidates is Jeb Bush, who had to beg the audience to clap in a humiliating moment. Jeb Bush tried to pull off a real barn burner of a speech in New Hampshire and when it didn’t stick he informed the audience that it was time for applause. ‘Please clap,’ the seemingly dejected former Florida governor told the crowd. The moment, first reported by the New York Times, pushed along the narrative that the once happy warrior, expected Republican nominee, is feeling the pressure now that he’s stumping in the Granite State, a place where he must perform. At the event, held at the Hanover Inn, which hugs the Vermont border, Bush wanted voters to approve of some lines he said about protecting the country as the commander in chief. ‘I won’t be out here blowharding, talking a big game without backing it up,’ Bush has said, according to the Times. The country, Bush suggested, needed to ‘get back in the business of creating a more peaceful world’. Bush, according to the Times, said he’s definitely staying in and heading to South Carolina after New Hampshire voters head to the polls next week, but making up lost electoral ground after his one-delegate pick-up in Iowa will be quite the feat. Bush, Carson Fiorina… why are they still pretending that they have a shot to win the race? It’s going beyond cringe-worthy at this point, and they should really do all of us — and themselves — a favor and just put themselves out of their misery.